The cell that can convert electric energy using a chemical process and vice versa is known as Electrochemical Cell. Best example of this is the battery we use in remote or wall clock which convert stored chemical energy to electrical energy. This cells work on oxidation-reduction reaction or redox reaction concept. Result in formation of many C-O bonds. Result in formation of many C-H bonds. The product formed will be having lower potential energy. The product formed will be having higher potential energy. Electrolytic Cells: In these cells electrical energy is used to carry out a non-spontaneous reaction. In nut shell, we can say that in galvanic cells, chemical energy is transformed into electrical energy, while in electrolytic cell electrical energy is converted into chemical energy. Galvanic Cells (also known as Voltaic Cell): It’s an instrument in which a redox reaction is used to convert chemical energy into electrical energy. The reaction used for generation of electricity takes place in two different cells. Each cell comprises of a suitable electrolytic solution and a metallic rod knows as Electrode (generally same type of electrode and electrolyte).The cells comprising of the electrode and the electrolytic solution are called Half-Cells. The moment two cells are connected via salt bridge and electrodes through a wire linked with galvanometer the electricity begin to flow. It’s a simple form of voltaic cell name after its discoverer an Italian scientist Alessandro Volta. Note: Voltaic Cell is a type of this cell. It was invented by a British chemist John F Daniel in 1836. 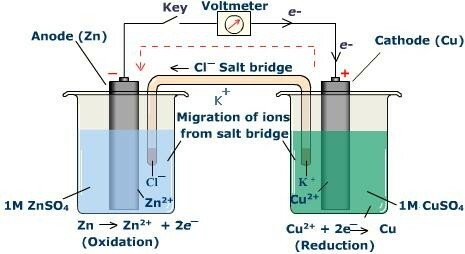 And in this cell ZINC and COPPER electrodes and electrolyte is used. Electrical energy is transformed into chemical energy. Chemical energy is transformed into electrical energy. Anode is positive electrode & Cathode is negative electrode. Anode is negative electrode & Cathode is positive electrode. Ions are discharged on both anode and cathode. Ions are discharged only on the cathode. If the electrodes are non-reactive or inert, concentration of the electrolyte decreases when the electric current is circulated due to electrolysis. Concentration on the side of anodic half-cell increases while that of cathodic half-cell decreases when the two electrodes are joined by a wire. Both the electrodes can be fitted in the same cell. The electrodes are fitted in different cell. In this cell a setup is made such as electricity is conducted through a electrolytic solution or its molten form or fused form which generates free ions, that’s why it is said rightly that electrical energy is converted to chemical energy in electrolytic cells. 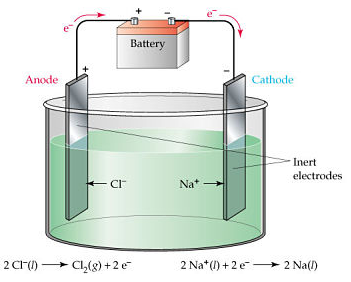 The working principle of conduction by electrolytic cell is illustrated by a cell in which electrolysis of molten NaCl is done between inert or Nobel electrodes which do not react with it. To get a proper setup of electrolytic cell, so that it helps to pass the current through aqueous solution of electrolyte that is, NaCl, two metallic rods are in it which is in turn is linked with the ends of a power source. These two metallic rods are called electrodes, the rod through which current enters in the aqueous electrolytic solution is anode, its positive end of the setup and the rod through which current leaves the aqueous electrolytic solution is cathode, its negative end of the setup. This entire setup excluding the external power source or battery is called Cell. The electrons flowing out through the negative electrode of the cell is received by negative terminal of battery. These flowing electrons are used up in the reduction reaction which takes place at cathode. The number of electrons accepted at the negative terminal of electrode is reverted back to the positive terminal of the power source via positive electrode of the cell, where electrons are coming out due to oxidation. This free motion of both types of ions gives rise to electrolytic conduction. Let’s see a condition which involves more than one type of cations in it. The capability of a cation to move towards the cathode, where it will gain electron and gets reduced depends on the factors like its mass, size, charge on it etc. Quoting this we can tell that it is difficult to predict, quantitatively, the correct order of reduction of cations. Because one factor may accelerate it and other may suppress. The best possible way to predict this is by giving a quantitative value or number on the overall effect of all the factors involved in the reduction ability of a cation. This quantitative number or value is called SRP-Standard reduction potential. A cation with higher SRP would get reduced preferentially faster  than the cation with lower value of SRP. The reverse of SRP is called SOP-Standard oxidation potential. In the electrolysis of aqueous solution of NaCl, H+ ion would be reduced to H2 gas by gain of electrons. (This H+ ion comes from water present as aqueous) at the cathode, on the other hand Cl- ions would be oxidized to Cl2 gas at the anode. The above stated concepts are although used in solving problems, it is not valid always. Because the ability of a cation to get reduced or an anion to get oxidized are also dependent on their concentrations. This tells that it is realistic to reduce a cation in preference to another cation although the SRP of the former cation is less than that of latter, simply by adjusting its concentration. A unique property of an REDOX reaction is that , it can be carried out with the reactants present separately in space and just linked by an electrical connection that is, chemical energy is converted into electrical energy. 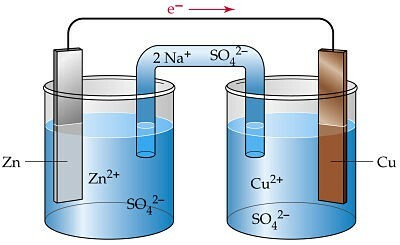 The setup consist of two beakers, one contains Cu2+ ions in it with copper rod as electrode, the second beaker contain Zn2+ solution and zinc rod as electrode. 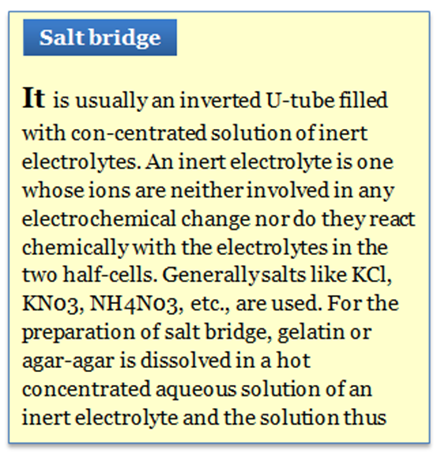 Since both of them are separated therefore in order to build connection between the two solutions an inverted U tube is used which is known as Salt Bridge. These contain agar-agar gel with electrolytic solution of KCl or NH4NO3. Let’s see what happens inside on microscopic level, the zinc rod gives out electrons which come out of it and starts travelling through external circuit, this produces Zn2+ ions which have higher affinity towards solution medium than solid rod. Thus Zn2+ ions come out in beaker which leads to decrease in size of Zn rod. On the same time the overall negative charge on copper side beaker increases because Cu atom gets deposited on copper rod. The word electro means electricity and lysis means kill. It is the phenomena of separating a compound into its participating/constituent elements by passing an electric current through its molten condition or aqueous solution. This theory explains that if an electrolyte contains more than two ions and electrolysis is performed, it is seen that all the ions are not discharged at the electrode at the same time but certain ions are liberated at the electrode in preference to others. According to this theory if all the ions are attracted towards a particular electrode, then the one which needs least energy to gets discharged is discharged first than others. The potential at which the ions are discharged is called deposition or discharge potential. The aqueous solution of NaCl contains ion like Na+, Cl- , H+ and OH- ions which comes from NaCl and ionization of water. Since water is a weak electrolyte its ion population is less. During reaction when potential difference is reached between the two electrodes Na+ and H+ ions move towards negative electrode that is cathode and Cl- and OH- ions move towards positive electrode or anode. At cathode between H+ and Na+ ions H+  ions are discharged, on the same ground Cl- ions are discharged in preference to OH- ions. Therefore, Na+ and OH- ions remains undisturbed in the aqueous solution and when the solution is evaporated it yields crystals of NaOH. Between Cu2+ ions and H+ ions Cu2+ ions is discharged at cathode, because Cu2+ ions have lower discharge potential, between OH- and SO42- , OH- ions discharged at anode due to its lower discharge potential. Finally copper is deposited at cathode and oxygen gas is released at anode. Between H+ and Na+ ions H+ ions are discharged at cathode as H+ ions have lower discharge potential than Na+ ions. Between SO42- and OH-, OH- ions are discharged at anode as these have lower discharge potential. Thus, hydrogen gas is released at cathode and oxygen gas at anode, that is, the net reaction describes the electrolysis of water. The ions of Na2SO4 conduct the current through the solution and take no part in the overall chemical reaction. At anode, the copper of the electrode is oxidised to Cu2+ ions or ions solution dissolve equivalent amount of copper of the anode. Thus, during electrolysis, copper is transferred from anode to cathode. At anode, the silver of the electrode is oxidised to Ag+ ions which go into the solution or ions dissolve equivalent amount of silver of the electrode. a. electrical energy into chemical energy. b. chemical energy into electrons. d. electrical energy into ions. Q3. Which of the following statements are incorrect regarding salt bridge? a. It connects the solutions of two half-cells and completes the cell circuit. b. It prevents transference or diffusion of the solutions from one half-cell to the other. c. It keeps the solutions in two half-cells electrically neutral. Q4. Which of the following gas is produced at anode during electrolysis of sodium chloride? Q5. Which of the following ions has maximum discharge potential?